As your business grows, Compile adapts to changes within your workplace and grows with you. Compile's simplicity and flexibility aims to keep your long-term costs low. 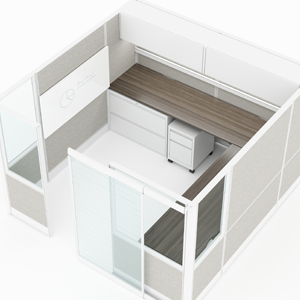 It's the affordable furniture solution to complete your office environment today AND tomorrow without sacrificing quality or beauty. 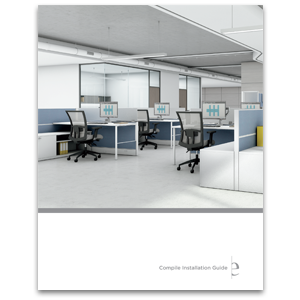 Compile panels and universal corner posts ship with pre-assembled "Quick Connect", which make it one of the easiest system products to install and reconfigure. Aluminum raceway covers hinge upward and lock in place, or can be easily removed providing open access and better protection, for power and data in the base of the panel. 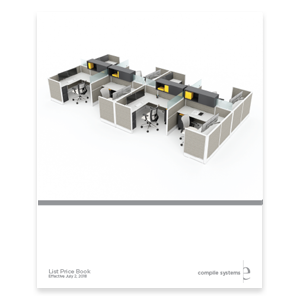 The Compile system offers a clean appearance from top to bottom. Panels are available in monolithic or single segmented, and utilize aluminum raceway covers that are available with or without knockouts. 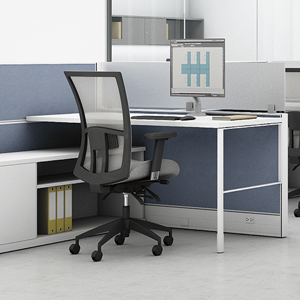 An innovative worksurface support and overhead storage mounting system eliminates the need for slots in the panel frames, providing a softer visual appearance. 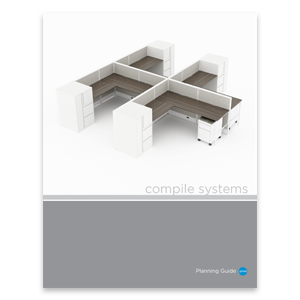 Download the Compile pricelist by section.